There is a lot to talk about with these results. While Google Chrome's 1ms timer request certainly uses more power than otherwise, everything else about Google Chrome seems to make up the difference -- at least for Chrome 36. Unfortunately, Chrome 37 takes a dive of almost 25% placing it roughly tied for last place with Firefox. Considering Chrome 36 and Safari are the only browsers on our list that do not support HiDPI displays, that could be the difference. 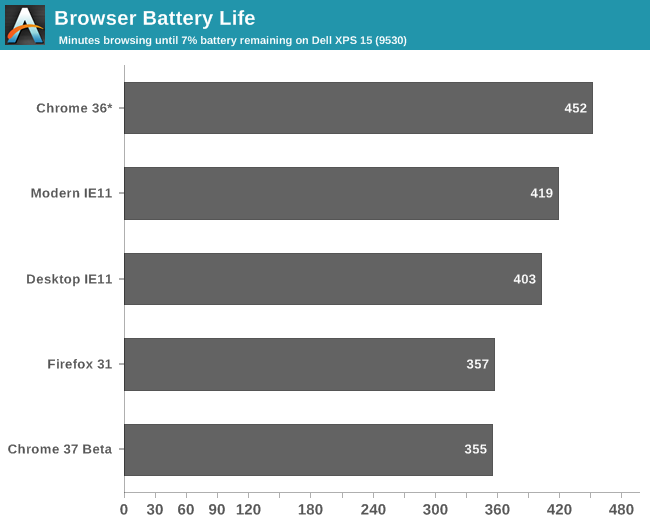 I have added an asterisk on the chart to indicate Chrome 36 is not quite doing the same work as the other browsers. There seems to be a significant battery penalty when natively rendering at 3200x1800 instead of 1600x900 and then scaling up via Windows. It would be interesting to repeat this test on a lower resolution display, but that would be largely academic, as many laptops today ship with HiDPI displays and more are always on the way. To be honest, I'm not sure anyone could actually use Chrome 36 on a HiDPI display without going crazy anyway, so the fact that Chrome 36 leads the pack here is probably irrelevant. Just to confirm, I did run a powercfg /energy report and Google Chrome was indeed requesting the high resolution timer. A few of our test websites also contain flash advertisements, so I was curious if these also caused Firefox and IE11 to increase their timers. Running the same powercfg /energy report did not show any timer increase for those browsers. As for Safari, unfortunately the browser was having all kinds of trouble being automated by our test suite. The browser window would lose focus every ten seconds and result in lost keyboard inputs. Looking into task manager, whenever Safari would lose focus "Windows Error Reporting" would appear in the processes list. After disabling the Windows Error Reporting Service, Safari instead threw unhandled exceptions every 10 seconds. Apple's website does not list any known issues regarding this error. Disabling display scaling, running at 1600x900 resolution, and reinstalling Safari did not resolve the issue. Considering Safari for Windows is still on version 5.1.7 from over two years ago and apparently won't be receiving any further updates, we decided it was best to simply exclude the browser from any further testing. I seriously question the validity of even including Safari in this test. Safari for windows hasn't been updated since 2012. And why on earth exclude a modern browser like Opera while keeping outdated Safari. Stephen originally tried testing Safari, and felt the issues were at least worth mentioning. We forgot to remove the "non-result" from the chart but that is now fixed.